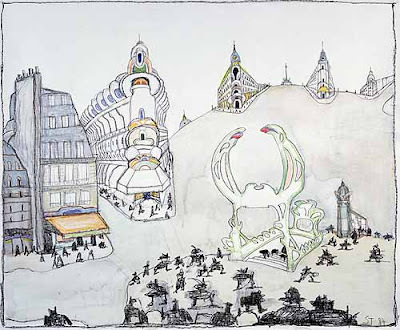 Over the recent holidays I spent some time with Saul Steinberg's Illuminations, a book which includes much of a show that I actually had a chance to see in person last summer in Washington, DC. 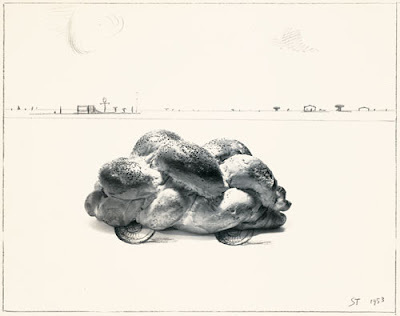 Although he's not a photographer, Steinberg's images have a lot to teach about photography. The general economy of his work is brilliant. If a line was needed he included it. If he didn't need it, he left it out. How he knew which lines were necessary is a mystery, but the lesson is there for photographers. Include what you need and not a bit more. 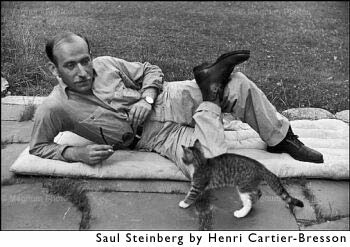 Steinberg was prolific. His published images are only the tip of the iceberg, the visible portion of a mountain of doodles on napkins, clothing, paper, wood, whatever at hand. He was constantly on, probably always had a pen nearby while awake. The model for a certain style of photography is obvious: camera in hand always. Only from constant practice and failure can perfection emerge. Steinberg's drawings are dense with ideas. There is a LOT going on in them, and it takes a while to sort through them intellectually. The eye needs to move around the image and usually the thing that draws you in does not end up being the primary subject matter. Since I tend to approach art with my mind before my emotions I find a lot to latch onto. 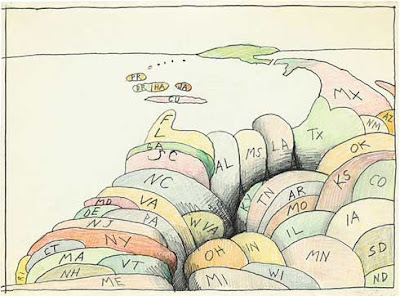 Steinberg's images take me longer to digest than most photographs. 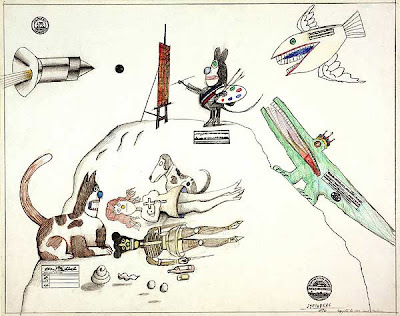 It's interesting the Steinberg primary medium was drawing on paper. He used crayon, pencil, pen, stamps, the tools of a preschooler. In the highbrow art world, the general assumption is that serious artists paint on canvas, and it must've taken a special confidence to defy that pressure. A parallel situation exists with 35 mm street photographers. For the photographic mainstream, 35 mm is the tool of the beginner. Anything shot smallframe is questionable, and street photography in particular is the lowest most base form of expression. The other side of the coin, Steinberg's side, is "Zen Mind, Beginner's Mind", the belief in a purity inherent in the use of simple tools. 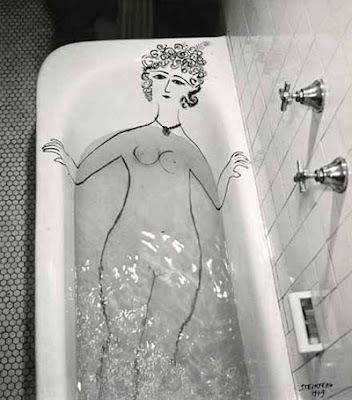 There is a connection between simplicity and absurd poetic whimsy which I do not completely understand, but it is there in Steinberg's drawings and in the finest 35 mm images. If you get a chance to see this book or other Steinberg collections, they're worth a look.